Jim Buxton keeps his boat, Nomad, at a berth at Merrill's Wharf. 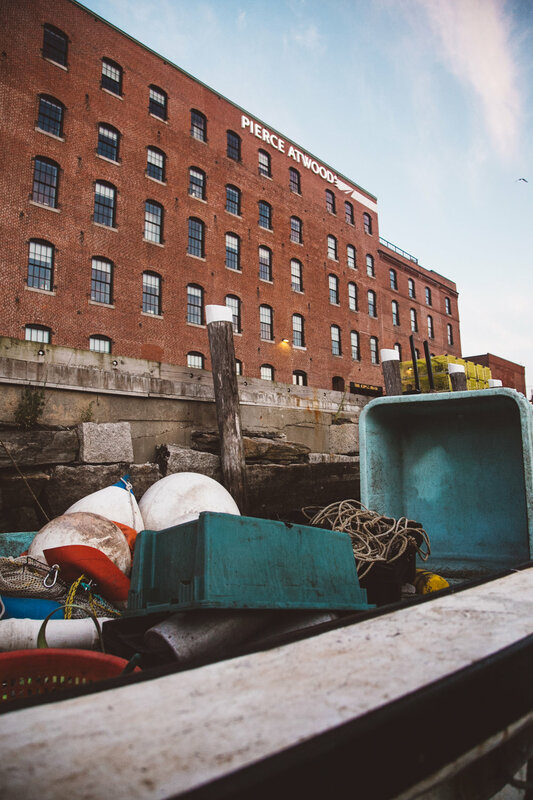 In this story he shares his thoughts on Portland's changing waterfront and the importance of maritime work in Portland Harbor. To listen to this story, watch the slideshow above. If you prefer audio only, go here. Jim Buxton has been working on the water for over 25 years. He moved to Maine in the 1980s to become a commercial diver for Aquatech. He worked for Cianbro, got a business degree from USM, and became a commercial urchin diver in 1992. His career on the water reflects the changes in Maine's maritime economy - at one time his work was diverse and varied. Now, he relies primarily on lobstering to make ends meet. Jim ties his boat, Nomad, on Merrill's Wharf. The wharf changed dramatically in 2011, when the Cumberland Cold Storage building became the headquarters of the Portland-based law firm, Pierce Atwood. What was once a dirt and gravel pier is now beautifully paved parking lots and cement sidewalks. These are, without a doubt, structural improvements. But to some maritime workers, like Jim, the neatly marked parking spaces and suited employees are worrisome. The mixed uses on Merrill's Wharf are compatible for now - but it's the future of the working waterfront that, at times, seems uncertain. Jim's forty feet of space sticks out on this pristine wharf. There are dirty fish totes and rope, moorings and buoys. It may look filthy and cluttered but it works, and it's his. To hear Jim's story, listen to the audio slideshow above or the audio link. Jim Buxton's berth on Merrill's Wharf.